West Florida Pumpkin Patches, Corn Mazes, Hayrides and More - Find Halloween and Fall Fun! Looking for a local pumpkin patch, corn maze, hayride, gourds and other Halloween activities in West Florida? Scroll down this page and you will see the all of those in West Florida, sorted by county. Some are farms, where you take a hay ride out into the field, others are elaborate farm stands with mountains of pumpkins and other activities and some are simple roadside stands. Most have loads of pumpkins to choose from. To really make it fun for your kids, look for those that have the extra activities, like a corn maze, spook house, or hayride. There is usually a small fee for the mazes (of course, the more elaborate mazes tend to charge more. Hayrides are often free. ALWAYS call before you go to confirm the info, they don't always report changes to me! 6000 Goodlette Road North, Naples, FL 34109. Phone: (239) 593-7600. Email: info@nnumc.org. Open: The 2018 North Naples Church pm;kin Patch is October 12 to 31; pm;kins of all sizes, corn stalks, and gourds will be available ranging from $1 to $20; A photo booth will also be available; Weekday hours are 3 pm to 7 pm; weekend 9 am to 7 pm; All proceeds benefit children and youth summer camps and mission trips. Directions: Florida's Route I-75 to exit 107, then west 2 miles to Goodlette-Frank Rd, Then make a Right on to Goodlette-Franks Rd, drive about a half mile on right to North Naples United Methodist ChurchClick here for a map and directions. Payment: Cash, only. Click here for our Facebook page. (UPDATED: September 10, 2018). 15990 Stur St, Masaryktown, FL 34604. Phone: 727-326-3256. Email: harvestmoonfarm77@yahoo.com. Open: October 3rd into November; Saturday & Sunday: 10AM-5PM, Night time Maze Saturday October 24th & Saturday, November 7th; Field Trips only on Tuesday to Friday Click here for current open hours, days and dates. Directions: Driving East on County Line Road just before you get to highway 41, make a left on to Kostka Dr. Kostka Dr and Stur Street run into each other. Driving on highway 41 turn on Stur St, going south it's 1 block before you get to County Line Rd; going North on highway 41 it's 1 block after County Line Road If you are coming from the Suncoast Pkwy (589) take the County Line Road exit, Drive East on County Line Road Just before you get to highway 41, make a left on to Kostka Dr. Kostka Dr and Stur Street run into each other. Payment: Cash, Debit cards, Visa/MasterCard, Discover, AmEx. 3325 Treiman Boulevard, Dade City, FL 33523. Phone: (352) 583-3647. Fax: (352) 583-0591. Email: info@ergletrees.com. Open: The Pumpkin Patch is open Friday, Saturday, Sunday, and Monday from 10:00am to 6:00pm October 3rd to October 31st. Directions: Ergle's is located 8 miles north of Dade City, Florida directly on U.S. highway 301. From I-75, take exit number 301 at Highway 50. Drive East on Highway 50 for 5 miles and turn South on Highway 301 and drive two miles. The farm is located on directly on Highway 301 on the West side of 301 (farm is 2 miles south of the Highway 301 and Highway 50 intersection on Highway 301). Click here for a map and directions. We offer a variety of pumpkins which include carving pumpkins, Cinderella pumpkins, Blue Jerrahdale pumpkins (for baking), pie pumpkins, green warty and red warty pumpkins, and wantabe pumpkins. We also have hay bales, corn stalks, and gourds for decorating. Train runs on weekends, weather permitting. PYO is available only when in season; Blueberries in May, Strawberries grown in hydroponic stackers are avabile in November, Thornless Blackberries in June, Pumpkins in October, Christmas trees are sold from the Saturday before Thanksgiving through December 23rd; See our website for additional information. Payment: Cash, Debit cards, Visa/MasterCard, Discover, AmEx. We also have fruit trees for sale. All varieties are self pollinating, require low chill hours, and are freeze resistant. Beverly Hills Apple Dorsett Golden Apple Gala Apple Gordon Apple 3 n 1 Fruit Salad Spice Zee Nectaplum Eva's Pride Peach Flordaking Peach Flordaprince Peach May Pride Peach Bella Gold Peacturn Weeping Santa Rosa Plum Shinseiki Asian Pear Giant Fuyu Persimmon. 5369 California Street, Brooksville, FL 34604. Phone: 727-207-6865. Email: sevenacresfarm@hotmail.com. Open: Hello to all our loyal customers, friends and pickers from Seven Acres Farm; I regret to say that we will be closing the farm for at least the next two years. My husband has opened a lucrative custom and repair shop that requires us to be working together daily. I have grown so fond of many of you and hope to see you again in the future. I am not giving up on our little farm! Just taking some time to focus more on my family and see where God leads me. Thank you so much to all who appreciated and valued our hard work. Farming is not an easy job to say the least, but the fruits of its labor our very rewarding. Directions: n/a. 17250 Benes Roush, Masaryktown, FL 34604. Phone: 352-279-0977. Fax: 352-597-8680. Email: updates@sweetfieldsfarm.com. Open: See our website for current hours; Weekends 10 am – 5 pm Starting September 26th and 27th; October: 3rd and 4th/10th and 11th/ 17th and 18th/ 24th and 25th; October 31st and November 1st; Special Weekday hours on Monday October 19th (10 am-2 pm), Friday October 23rd (10 am-2 pm) and Monday October 26th (10 am-2 pm). Click here for current open hours, days and dates. Directions: And for a map to our farm, click here. Crops are usually available in October, November. Payment: Cash, only. Everything is grown with organic methods. We will be certified soon. A visitor writes on October 29, 2011: "Hello. We've been taking our children to Sweetfields Farm for 3 years in a row. We all love it. There's a ton of fun activities and, each year, they seem to get better than the last such as a HUGE cornstalk maze, live storytellers and a big tree house. We despise the "side of the road pumpkin patch" - that's no way to fully experience the fun of a farm AND picking out a pumpkin. Speaking of which, a large pumpkin at Sweetfields Farm is on average $10 ... not $40 like some of these faux pumpkin stands.!" 19125 Phillips Road, Masaryktown, FL 34604. Phone: 352-308-0110. Email: danebbecke@bellsouth.net. Open: Friday to Sunday 9 am to 6 pm. Directions: From US 41 take Ayers Road 1.7 miles east. Turn right on Phillips Road. We are 1 mile down Phillips Road on the left. We are in a bend in the road but there is a sign at the gate. Click here for a map and directions. Pumpkin patch u pick pumpkins is open October 9 to October 31 Strawberries start November 1 to April 15 Blueberries start April 1 to May 15 Blackberries start May 1 to June 1. Payment: Cash, only. Click here for our Facebook page. A visitor writes on October 11, 2012: "Just read that Futch Family Farms is having the first corn maze in Hillsborough county this year - the Fox Squirrel Corn Maze. It will be open Oct 13 - Nov 11. They are having a pumpkin patch and games too. " Tampa Bay Farmers Market – Pumpkins, Corn Stalks, Straw Bales & More. 5534 Turkey Creek Rd., Plant City, FL 33567. Phone: 813-737-1312. Email: Tampa peggy@turkeycreekstables.com. there are no pumpkins here, but plenty of horses, ponies and hayrides! Plan a fun (and unique) birthday party for your children - horses and ponies are available for groups. The group can ride on the trails or stay in our large arena. Also, ride through the neighboring park on a traditional hay ride. Hay Ride and Pony Ride Party: We will pick your party up at Medard Park with a hay wagon and bring you back to Turkey Creek Stables. At the stables, you have four ponies (or a combination of horses and ponies) for everyone to ride in the arena for an hour. The children (of all ages) take turns riding the ponies (assisted by their parents) for an hour. We will provide someone to walk the ponies/horses for an additional $5.00 each (2007). Call us to reserve your pony today! When the hour is over, we take you back to Medard Park on the hay wagon. The cost is only $80 (2007). For older children, we offer our regular hourly horse rentals so that they may ride on the trails. If you have ten or more riders, there is no charge for the hayride. If you have less than ten riders, there will be a charge of $15 (2007) for the hayride. We now have a party room available for your party. Pony Rides at Your Party: We will also bring a pony, or horse, to your home for parties. We have a three-hour minimum requirement and handlers are available for an additional charge. The cost is based on where the pony is to be delivered. 4135 Dr. Martin Luther King Jr. Blvd, Fort Myers, FL 33916. Phone: 239-334-7001. Email: customerservice@fleamall.com. Open: Great Pumpkin Festival Saturday and Sunday October 10 to 13th. Click here for current open hours, days and dates. Pumpkin updates: Click here for updates. Directions:; Easy to find on S.R. 82 1-1/4 miles west of I-75, (exit 138), Ft. Myers, FL. We're a short drive from the beaches, Cape Coral, Bonita Springs, Naples, Lehigh Acres, Punta Gorda and Port Charlotte. Click here for a map and directions. Come celebrate the fall harvest season at Fleamasters' Annual Great Pumpkin Festival; This event will get bigger and better each year, making it a great time to plan a trip to Fleamasters or plan to sell at the market; Highlights include: Pumpkin Carving Competition, Pumpkin Farmer's Photo Spot, Pumpkin adoption and decorating at the Great Pumpkin Patch; Plus live entertainment on stage, games, face painting and balloon animals. Payment: Cash, only. Click here for our Facebook page. 5170 S Cleveland Ave, Fort Myers, FL 33907. Phone: 239-229-6582. Fax: 239-437-5911. Email us at: Treeman4@aol.com. Directions: I75 exit 131 go West to US 41 (Cleveland Ave) turn left (South). We are located about 1 mile on the right hand side of the road. Just look for the Uncle AL's banner. And for a map to our farm, click here. 30771 Betts Rd., Myakka City, FL 34251. Phone: (941) 322-2802 . Email: info@dakindairyfarms.com. Open: the farm opens to the public usually starting October 31 and continuing to Mid January; BUT.. CALL FIRST the 2015 date is TO BE DETERMINED DUE TO HORRENDOUS RAIN FALL THIS SUMMER; open for school tours starting October; see this page for complete dates and hours! Admission prices: see this page. 5500 C.R. 675, Bradenton, Florida. Phone: 941-322-2168. Email: dkhunsader@msn.com. Open: October 10, 11, 17, 18, 24, 25 from 9am-5pm. This event has a little something for everyone, with activities for the young in age to those that are only young at heart. Come and enjoy: 150 Craft Booths, Live country music performed by Night Train and Southern Star Bluegrass, Corn maze, Butterfly experience, Scarecrow Displays, Children's train ride, Circus tent, Clogging, Charity Pumpkin Games, Pioneer Trades Village & Antique Engines, Hayrides & Pony Rides, Fresh produce, Petting Zoo & Barnyard Playground. A visitor writes on June 19, 2011: "they do a great show. Really large and popular pumkin maze and craft show it is a 3 weekend event"
A visitor writes on August 23, 2010:: "I really enjoy the farm every year...A must though, wear closed toe shoes because the parking lot is a dirt lot full of ants! But the festival isn't. A lot of family fun...something for everyone! 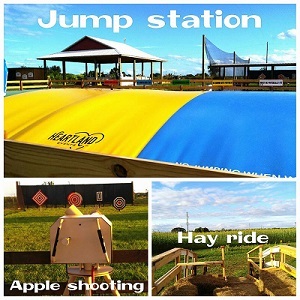 For the pumpkin patch festivity they have pumpkin patch, petting zoo, pony rides, hay rides, train ride, arts and craft booths, concessions, face painting"
7308 Verna Bethany Road, Myakka City, FL 34251. Phone: 941-322-0429. Fax: 941-322-9604. Email: hydroman@hydrotaste.com. Open: The farm is temporarily closed while we grow more produce;. Please check back for our re-opening; Opening on Sundays in November for u-pick strawberries; Tuesday to Saturday 9 am - 5:00 pm . Directions: I-75 south from Tampa area to exit 217. Go east on SR 70 twelve miles to Verna Bethany Road. Turn left on to Verna Bethany Road and go two miles, look on left for farm. See this page on our website for a map and directions. And for a Mapquest map to our farm, click here.. Crops are usually available in All year. Because our strawberries are grown on raised platforms, there is NO NEED FOR YOU TO BEND OR KNEEL DOWN TO PICK!!! Pumpkin Carving classes will be offered Saturday 10/27/07. Call for more information. Strawberry plants and Blueberry plants for sale in October/November for Fall planting. We follow organic methods, but are not yet certified. Payment: Cash, Check, Visa/MasterCard, Discover, AmEx. Come join us every Saturday to learn how to grow hydroponically. No charge for classes in our air conditioned training facility. Call Janine at 941-322-9602. 8400 Monarch Dr, Port Richey, FL 34668. Phone: 727-389-2552. Open: 7 days a week from Noon to 8pm, maybe later is busy starting October 16th through October 31st. Click here for current open hours, days and dates.. Directions: Click here for a map and directions. Payment: Cash, only. 17810 Forge Dr., Spring Hill, FL 34610. Phone: 352-799-7612. Email: mcknightjanis@bellsouth.net. Open: The festival is a one-day event in October, held on a Saturday, see our website for this year's date; in 2015, it's on October 17, 2015 Saturday 10 - 6. Click here for current open hours, days and dates. Directions: Click here for a map and directions. Payment: Cash, Check, Debit cards, Visa/MasterCard, Discover. Strong Tower Vineyard's Annual -Harvest Pumpkin Patch Festival, Arts & Crafts Show! Enjoy the autumn season at the vineyard with your family! Visit the Punkin Patch, Taste some wine, Walk to the vineyard, Visit all the Artisans' tents & works of art. Have a great time doing your Christmas shopping! Find Unique Arts & Crafts, Pumpkins, Foods & Drinks. The "Toymakers" with their hand made wooden toys will be here for all the kids to see. Wine will be available by the glass or bottle. No entrance fee. Free parking. 2680 Landmark Drive, Clearwater, FL 33761. Phone: 727-797-0703. Email: rachelt@heritageumc.com. Open: October 11 am to October 31 Mon - Thurs 9 am to 8 Friday - Sat 9 am to 9 Sun 12 pm to 9. Click here for current open hours, days and dates. Directions: Click here for a map and directions. Payment: Cash, Check, Debit cards, Visa/MasterCard. Click here for our Facebook page. Family photo backdrop. Bring the kids and the cameras!. 2686 Bayshore Blvd, Dunedin, FL 34689. Phone: 727-733-9305. Email: kirkchurch@hotmail.com. Open: 10/22/12 thru 10/31/12 12 pm to 8pm 7 days a week. Directions: Located just north of Curlew and Bayshore Blvd (Alt 19) intersection Just north of McDonalds. Click here for a map and directions. Payment: Cash, Check, Debit cards, Visa/MasterCard, Discover, AmEx. 13444 Moore Road, Lakeland,, FL 33809. Phone: 863-859-6472. Alternate Phone: 863-559-1739. Fax: 863-859-9714. Email: info@cornfusionmaze.com. Open: Starting the first Friday in October, Fridays at 2:00 Saturdays at 9 am and Sunday at 12 pm close each day at 6 pm Zombie Farm Paintball Hayride 7 pm to 10 pm Friday and Saturday nights only. Directions: 10 miles from I-4. Click here for a map and directions. Payment: Cash, Debit cards, Visa/MasterCard, AmEx. Our Corn Maze this year is a Crop Maze made up of All Native Florida Plant Life. A visitor writes on October 01, 2011: "This was their first year and also day. We had a great time. There was also a bouncing thing it was open and for all ages. TICKETS: $10 for adults, $8 for ages 5-10 and free for children younger than age 4. " 950 Tavares Road, Polk City, FL 33868. Phone: 352-895-8687. Email: Harvestholler@gmail.com. Open: from September 25 to Sunday November 15 on Friday from 4 pm to 8 pm, Saturday from 12 pm to 8 pm and Sunday from 1 pm to 5 pm; Monday to Thursday: by reservation only. Click here for current open hours, days and dates. Directions: Click here for a map and directions. Payment: Cash, Debit cards, Visa/MasterCard, Discover, AmEx. 5718 Antilles Drive, Sarasota, FL 34231. Phone: 941-726-9913. Email: drpaininsane@aol.com. Open: opens in October, 2016. Directions: Click here for a map and directions. Payment: Cash, only. Click here for our Facebook page. Note that there is no pumpkin patch or corn maze: just the haunted house and it will not be open until October 2016! 7410 Fruitville Rd, Sarasota, FL 34240. Phone: 941-377-0896. Alternate Phone: 941-376-1020. Email: fruitvillegrove@aol.com. Open: Saturdays and Sundays during the month October, from 10 am to 5 pm; Pumpkin Fest hours are on our website. Directions: Exit 210 off I-75 One and one half miles east on Fruitville road Right past the Texaco gas station on the right hand side. Click here for a map and directions. Fresh farm market open all season! Annual Pumpkin Fest every weekend in October. Payment: Cash, Check, Debit cards, Visa/MasterCard, WIC Vouchers. Click here for our Facebook page. Organic and Gluten-Free items, Local grown produce, Country cheese shop, Amish made canned goods, Big Olaf Hand dipped Ice Cream and All natural fruit milkshakes and smoothies. 2050 Adams Lane Payne Park, Sarasota, FL 34236. Phone: 941-706-7605. Email: Lazarus@SarasotaPumpkinFestival.com. Open: October 23rd, 24th and 25th, 2015 from 12pm - 10pm (Friday and Saturday), 12pm-8pm (Sunday). Directions: Click here for a map and directions. Payment: Cash, Check, Debit cards, Visa/MasterCard, Discover, AmEx. 6th annual festival. This year's grand event will be bigger and better than ever. With a location more welcoming, accommodating and inviting to all and a layout that will surpass all previous years, the dynamic combination of all things pumpkin, over 100 free live shows, live entertainment, food and craft vendors, pumpkin patch, pumpkin maze, an interactive family fun kids zone complete with amusement rides, carnival games and an inflatable zone, safe trick or treating, hay rides and everything else Pumpkin will put the community of Sarasota in awe. Bringing together world-class entertainment and exciting newcomers to the main stage, l.
A visitor writes on April 28, 2013: "2013's 5th Annual Event benefitting The Lazarus Foundation Kids Force. Working together with the community to raise money for a great cause. Affordable family fun for everyone!"